This giveaway is now closed. Stay tuned for the winner announcement. Thank you all so much for entering! How long after you became a mama did it take you to put away the chunky necklaces and the dangly earrings? How sad were you when you realized babies and jewelry don’t always mix very well? Well, break them out again! Posh Baby Boutique is offering our readers a giveaway of Smart Mom Jewelry Teething Bling® — fashionable and functional jewelry made just for moms! The pendants are made of a nice, squishy, safe silicone. Your baby can’t hurt it! In fact, your baby will love it. 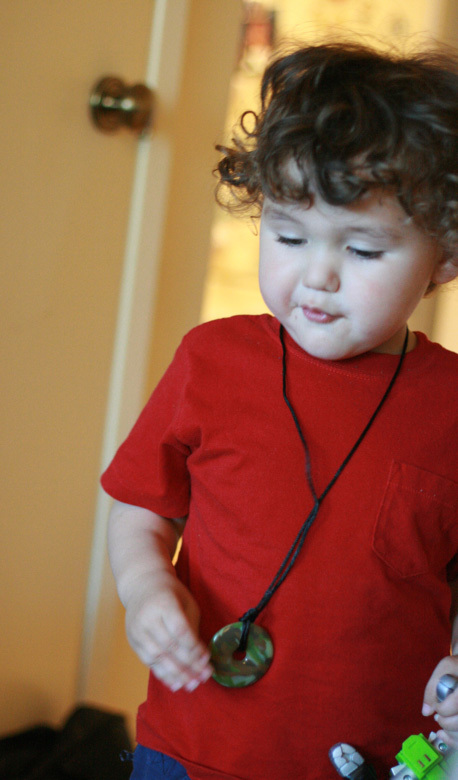 That’s right: Smart Mom jewelry was designed for babies to chew on. The silky cord that hangs around the mama’s neck also features a breakaway clasp as an added safety feature. And the best part? The necklaces look great! 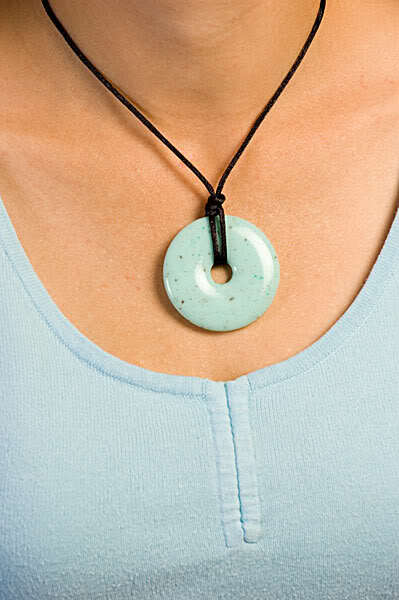 The donut shape pendants come in many different stylish colors and patterns. 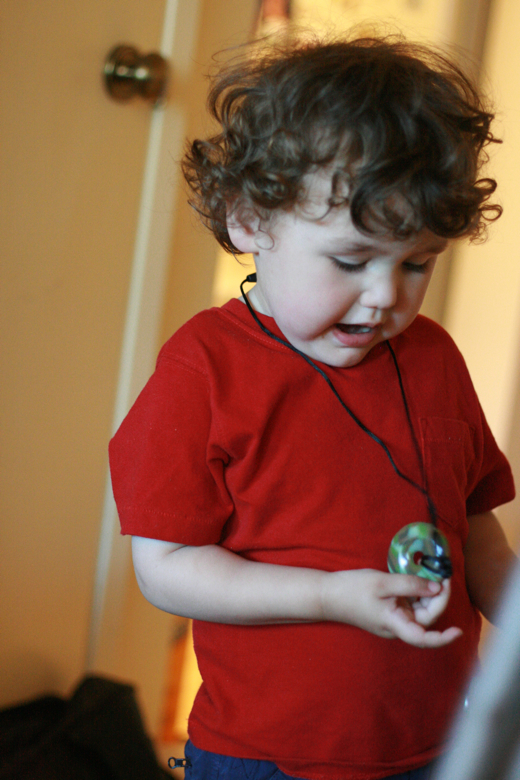 No one will know your necklace is baby-approved … until your baby starts gnawing on it and you don’t object! Smart Mom Teething Bling necklaces are perfect for teething babies, because they can gum them to relieve the pressure on their jaws. It’s a natural pain reliever, and the high-quality, phthalate-free, non-toxic silicone is safe for them to have in their mouths. I ended up winning a Smart Mom Teething Bling necklace in another giveaway, so I was able to check it out in person! I don’t have a baby who’s the age intended for the Teething Bling, but I do have a preschooler who was happy to model for me. The material is a federally approved silicone. It’s latex-free, which is good because there are a number of people with latex allergies. Silicone is soft and pliable and ideal for massaging a teething infant’s gums. The silicone is food–safe (you might have a silicone pan or two around your kitchen) and even dishwasher-friendly if it comes to that! The cord is a thick, silky black with a breakaway clasp. It hangs down long enough that your baby can easily reach to chew and fiddle while being held or breastfeeding. The design of the pendant and cord is simple, and I find it quite elegant. I didn’t feel like it stands out as “baby” jewelry — it just looks like a trendy pendant and cord. I like that there are many different colors to choose from, some funkier and some more low-key. You should be able to find a style to suit your taste — or choose a bunch to match each outfit! Because of the streamlined design, this is the kind of necklace you could wear every day. It would make a lovely and understated signature piece. And then imagine everyone’s surprise when you pop it in your baby’s mouth! The silicone could theoretically be bitten through, so Smart Mom cautions mothers that it’s to be used only on babies who are teething, with teeth only just emerging. Keep an eye on your little chewers to make sure the jewelry looks safe and whole at every use. I’m confident that you and your baby will enjoy the Smart Mom Jewelry Teething Bling. You can find Smart Mom Teething Bling at Posh Baby Boutique at $19.99 for a pendant and cord necklace. Giving a Smart Mom necklace would be like giving two gifts in one, because it’s partly for the baby, but it’s also a way to show you care about the mama. No one wants to feel frumpy in those postpartum days, after all, and I just love the idea of functional jewelry that’s still stylish. If the mother intends to breastfeed, it’s also a way to support her in her decision by giving her a tool that will come in handy when she needs it. While you’re over there, check out the other quality items at Posh Baby Boutique. Many of the selections are custom-made, personalized, and/or mama-designed (just like the Smart Mom Teething Bling). For instance, who doesn’t love tutus and PettiSkirts? (I seriously wish they made them in my size!) The baby apparel and girls boutique clothing is to die for, and she carries eco-friendly baby essentials like cloth wipes, cases, and changing pads and gift sets perfect when a baby shower is on the calendar. For your own chance to win a Smart Mom Teething Bling necklace from Posh Baby Boutique, enter in the comments below! Contest is open to U.S. & Canada. Head on over to Posh Baby Boutique and tell us which Smart Mom pendant you would choose! Tell us why you want this necklace! Have a look around Posh Baby Boutique, and tell us another item that catches your eye. Follow Posh Trendy Blog through Google Friend Connect, or subscribe to the Posh Trendy Blog RSS feed in a reader or by email (1 entry for each). Sign up for the Posh Baby Boutique email newsletter. Follow @PoshBabyStore on Twitter and leave your Twitter name in the comment. Like Posh Baby Boutique on Facebook. Enter another of the current giveaways on Natural Parents Network (1 extra entry per giveaway — check back for more). Contest open to United States & Canadian mailing addresses only. Contest closes February 3 at 11:59 p.m. PDT. Disclosure: We did not receive any compensation or product for review. 1. I would love the amythyst pendant, since pretty much half my clothes are purple! 2. I also love their cute changing pads and colorful cloth wipes. 3. I subscribe to NPN in my Google Reader. 4. I entered the Playful Parenting giveaway on Codename Mama’s blog. I couldn’t limit it down to one, so it would be blue camo, moonstone or brown snowflake! I would LOVE this necklace because my little guy likes to keep busy, especially while feeding and he is always grabbing my hair, bra, shirt, etc. He would find it fascinating! I subscribe to Natural Parents Network! Liked Natural Parent Network on FB!